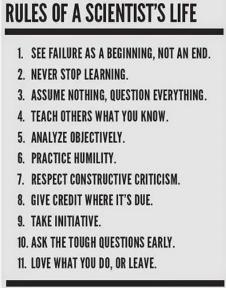 Have you seen the graphic entitled ‘Rules of a Scientists Life’ floating around the internet or on Facebook or twitter? It seems you cannot miss it. I tried unsuccessfully to trace the origin of these rules. I really don’t know if these rules come from a scientist, or some scientific body, or were made up by someone. Either way, I do believe these rules have value to us in our own lives; That these rules serve us well in The Choices we Make. What do these rules mean? I will leave their interpretation to you, but offer the following comments. See failure as a beginning, not an end.- In science, experiments are designed to prove a hypothesis (a guess). Failure is commonplace, and expected. Without failure, some of our most famous inventions would not have been around, or in their current form. In life and career, Fail Early. Never stop learning – Scientists publish their work in peer review journals, to encourage collaboration and validation. As we learn, we grow, the prepared mind can react to new situations. Assume nothing, question everything – Currently held beliefs may appear valid, but to the scientist, they constantly question all inputs as a matter of process: Circumstances change. For hundreds of years, man believed all heavenly bodies revolved around the earth, now we know so much more. Teach others what you know – To advance, knowledge we must share knowledge. All of us come from different backgrounds and therefore have different perspectives. It could be that one different perspective that leads to a breakthrough. Respect constructive criticism – Constructive criticism is a communication technique intended to identify and find solutions to problems in a positive way. Constructive criticism is meant to help, not belittle. Give credit where it is due – Scientific journals go out of their way to provide credit for work. In life and career there is always a leader, but even small contributions make a difference. Take initiative – Experimentation is the life of a scientist. Scientists take initiative, as they live for progress. Improve your value to your family, friends and peers, be bold. Ask the tough questions early – No one wants to waste time working on flawed experiments or findings. Take the time to set up your own experiments (family events, business planning, etc), so that you are not re-doing work later on, and so the results make a difference. Love what you do, or leave – The scientific life can be monotonous and repetitive, so can ours. . If you do not love what you do, find something else – be happy.